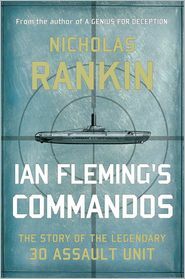 In May 1941, Ian Fleming and his boss, the Director of Naval Intelligence, Admiral John Godfrey, were touching base in New York City with William Stephenson, the British Secret Service’s representative in North America as head of British Security Co-Ordination, whose headquarters occupied the 34th and 35th floors of the Rockefeller Center. The place later went into Fleming’s fiction. In chapter 20 of the very first Bond book, Casino Royale, James Bond confesses to the assassination of a Japanese cipher expert cracking British codes on the 36th floor of that building – it was the first of the two wartime cold-blooded killings that led to Bond’s Double O number. On 28 May 1941, Ian Fleming celebrated his 32nd birthday in New York City with the good news that the Royal Navy had sunk Germany’s greatest battleship, the 42,000-ton Bismarck. Then he and Godfrey travelled by train to Washington DC on their mission to persuade the American authorities that they needed to create a unified American secret service. Intelligent combination in the USA would be an improvement on the system in the UK, which had evolved four different bodies with overlapping functions and competing masters: the blockaders of the Ministry of Economic Warfare (MEW), the propagandists in the Political Warfare Executive (PWE), the saboteurs in the Special Operations Executive (SOE) and the spies of the Secret Intelligence Service (SIS or MI6). Before WW2, the United States of America had similarly left foreign intelligence variously to the diplomats of the State Department, the Military Intelligence Division (or G-2) of the War Department and the Office of Naval Intelligence. No-one below the White House was collating intelligence and no-one was taking the big strategic view. Although Admiral Godfrey found all three US departments polite and friendly towards him, he was surprised to discover how much the US Army and US Navy loathed and detested each other and what a snakepit bureaucratic Washington could be, like Whitehall at its very worst. That very same day, 10th June 1941, William J. Donovan, (the American ‘Bill’ of the previous blog), had submitted a memorandum to the President recommending the establishment of ‘a central enemy intelligence organization’ to analyze and appraise all information on enemy intentions and resources, both military and economic, and to determine the best methods of waging economic and psychological warfare. A few days later, the war expanded dramatically in Eurasia. On 22 June 1941, Germany launched Operation BARBAROSSA, attacking Russia with 3.6 million men, 3,600 tanks and over 2,700 aircraft. Adolf Hitler and Joseph Stalin tore up their cynical Nazi-Soviet Pact and turned to rend each other in a monstrous struggle that would cost the lives of millions on the eastern front. The USA, with an army of only 1.9 million men, would stay neutral for another six months, until the Japanese attack on Pearl Harbor. But Ian Fleming, in Washington DC, kept working to help America prepare. Nicholas Rankin spent twenty years broadcasting for BBC World Service where he was Chief Producer, Arts and won two UN awards. He is the acclaimed author of A Genius for Deception: How Cunning Helped the British Win Two World Wars and Ian Fleming’s Commandos: The Story of the Legendary 30 Assault Unit. You can read part 1 of this series here and part 3 here.